The Maine lobster industry is making an unprecedented effort to market its product and increase demand. Lobstermen, dealers, and processors are pitching in to pay for a $6 million, three-year marketing campaign, in the hopes that increased demand will increase and stabilize the price of lobster. The Maine Lobster Marketing Coalition is working with the global public relations firm, Weber Shandwick, to convince consumers and chefs that Maine lobster has the finest taste, and is best for cooking creative dishes. "It tastes better, you can only get it in Maine, and you can only get it during our lobster season," said MLMC Executive Director Matt Jacobson. Jacobson said the collaborative's market research has unveiled some startling statistics. In a survey of thousands of casual, up-scale restaurants from Delaware to Maine, they found just four percent had "Maine lobster" on the menu. In a national survey, the collaborative found that nearly 75 percent of restaurants did not specify where the lobster was caught. "We need the consumer to realize that they can get a very good tasting product they're not used to having so they will want that," said lobsterman Stephen Train. 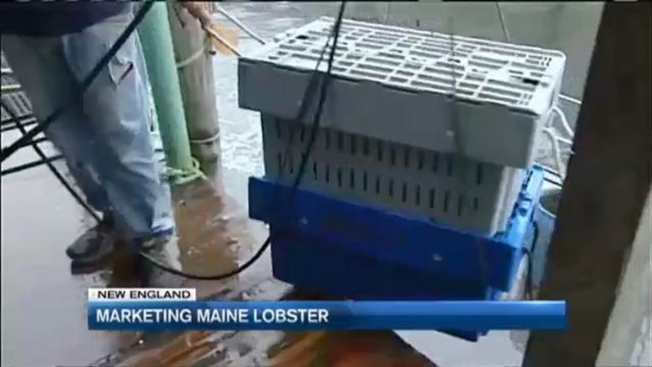 Train said the Maine lobster industry is fighting the perception that hard-shell lobster, often caught in Canada, ships more easily and contains more meat. "We're finding out now that the new shell can ship if we take good care of it," said Train. Train believes the marketing campaign will be a worthwhile investment if it means increasing lobster prices. In recent years, the catch has outweighed demand, and prices for Maine lobster have plummeted. The marketing campaign will be pursuing food bloggers, chefs, and influential people in the industry to generate more interest in Maine lobster. "Our intent is to conquer the Northeast this year, and then head out to the rest of North America and overseas," said Jacobson.